The "AGM" technology is efficient and leaks no acids, no matter what angle they're at! That's good news for sailors, who go around the world at a tilt. Taking a charge from electrical cords or auxilary power, the 650-amp house batteries perform reliably and fit our requirements within the magical "60% remaining" limit. What we've learned: they are unhappy if not fully charged so we are converting to gels. www.siemenssolar.com We mounted four of Siemen's 55-watt panels on our radar arch, and are extremely happy with them. Ranging from 3 amps on a cloudy day to 12 in the sun, these 51"x13" panels quietly, reliably and consistently provide the majority of our energy when we're unplugged. We are not very enthusiastic about starting up the engine, and with this generating capacity, we rarely need to. (619) 224-2733 The wind turbine/trolling combination of this unit has much appeal, though we've only tested the wind-driven capabilities. In 10-knot winds, the 3 amps it provides are a welcome addition to our auxillary electrical source. It is not a fixed-mount, but hangs from a halyard in the forward area of our deck when we're at anchor. If the sun is shining brightly, we tend to just rely on solar, but expect there will be days our momma didn't tell us about with no sun and lots of wind...stay tuned. This inverter/charger is at the core of our electrical system, and can even run our 900-watt microwave! With a pulse width modified squarewave, its power supply is suitable for running everything we have. 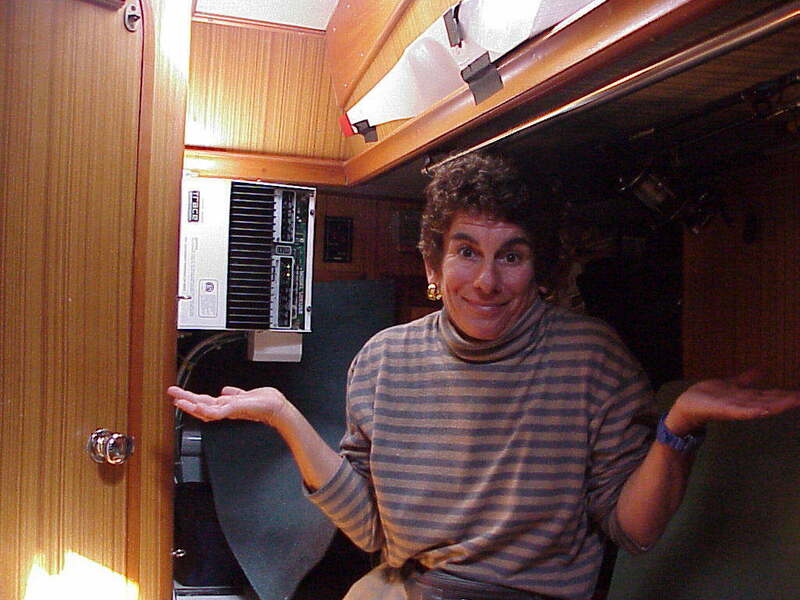 However, some individual products like the computer and hand-held VHF radio need their internal batteries recharged. For this, the modified sinewave does not seem to work, as the units think they're still dead.. (We tried using the small "Sorcerer 250" inverter, but had the same results.) In all other respects, we are extremely happy with the Trace. After the lightning strike in 2003, we replaced this Inverter/Charger with two separate units: a Xantrex 1800 inverter and a Xantrex 40+ charger. Stay tuned for performance comments! Fondly referred to as the "EMON II", this unit monitors battery charge and consumption, measures contributions from solar & wind, sets high & low alarm levels and is a way for mere mortals like us to have a clue what's going on with all those hidden batteries and their contribution to monitor the systems trying to keep us alive. After the lightning strike in 2003, we replaced this with a Xantrex Link 20. Other As with all complex systems, they sometimes compete with each other for the same resources. So, we have eliminators, regulators, heat sinks, galvonic isolators, charge controllers...and probably a bunch of other stuff Les hasn't had the time to explain to me. If you really want to know the details, send him an email...there's a wealth of information he'd love to share with you.